It is with deepest regret that DWO announces the passing of Classic Series Doctor Who Actress, Caroline John. It is understood that she passed away on 5th June 2012, but news has only been made public today. DWO would like to extend our sympathies to Caroline's family and friends, and particularly her husband (and fellow Doctor Who actor) Geoffrey Beevers. @WhoFrazer - @DrWhoOnline so so sad to hear the news. Another of our family gone. @dn21media - @DrWhoOnline She really made that first season of Pertwee top notch, excellent particularly in Spearhead and as Evil Liz in Inferno. Rare behind-the-scenes footage from Dalek Invasion of Earth: 2150 A.D has been discovered. 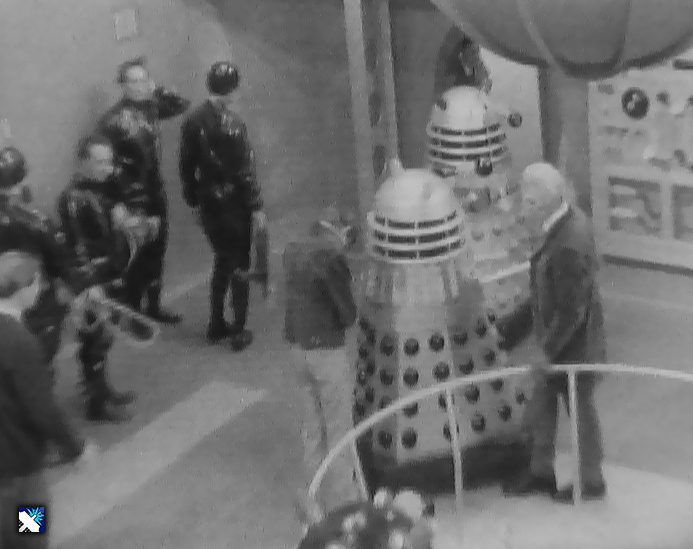 The brief clip shows movie Doctor Peter Cushing preparing to battle arch foe, The Daleks during the making of an early big-screen adaptation of the long-running sci-fi series. The precious black and white footage, taken on the set of cult sixties film, also captures director Gordon Flemyng - father of film star Jason - behind camera as he talks with stunt-men and plans out the movie's climatic final scenes. The material is the first to be uncovered documenting the 1966 film and forms part of a 'lost' TV show found recently in the possession of a collector living in Wales. Though the BBC wiped the master-tape of A Whole Scene Going, a copy of the magazine show - also featuring an interview with Flemyng and musical performances by the Spencer Davis Group - was made and found its way on to the collector's circuit. “A Whole Scene Going is an exciting TV find. For Doctor Who fans there's a fascinating glimpse into the making of feature film Dalek Invasion of Earth: 2150 A.D., showing Peter Cushing as the Doctor on the set along with director Gordon Flemyng and lots of Daleks. For music lovers there are priceless performances by classic British beat band the Spencer Davis Group as well as American singer/songwriter Judy Collins. Sixties pop shows were routinely shown live or wiped after transmission so it's great to find one that slipped past the eraser's magnet!" The recovered edition, from March '66, captures Flemyng at Shepperton Studios while directing an action-packed finale involving Horror icon Cushing and an army of Robomen thwarting a Dalek plan to drop a giant bomb into the Earth's core. Cushing played the Time Lord - currently portrayed on TV by Matt Smith - in two Flemyng-directed films during the height of “Dalekmania”, also starring in 1964's box-office hit Doctor Who and the Daleks. Interspersed with the footage is an interview with Flemyng - who died in 1995, aged 61 - revealing that he preferred making “entertainment pictures”as opposed to more high-brow films, but “didn't take them any less seriously”. Kaleidoscope and the TDA - who bought the film print privately from the collector - are currently in the process of returning a digital copy to the BBC Archive. Eager fans will get the chance to see the recovered footage for the first time in more than four decades at Kaleidoscope's next screening event, taking place in Stourbridge, West Midlands, on Saturday 9th June. To see a clip from the recovered show visit www.timdisneyarchive.com. It is with deepest regret that DWO announces the passing of Classic Series Doctor Who VFX Desginer, Peter Wragg. Peter was perhaps best known to Doctor Who fans for his work on the 5th Doctor adventures; The Visitation & Resurrection of the Daleks and the 6th Doctor adventure; Minwarp, which formed part of the Trial of a Time Lord season. It is with deepest regret that DWO announces the passing of Classic Series Doctor Who Actor, Tony Sibbald. Tony was perhaps best known to Doctor Who fans for his role as Mr Huckle in the 4th Doctor adventure; Terror of the Zygons. Sibbald also had roles in movies, such as Superman II and A View To A Kill. DWO would like to extend our sympathies to Tony's family and friends. It is with deepest regret that DWO announces the passing of Classic Series Doctor Who Actor, Richard Henry. Richard was perhaps best known to Doctor Who fans for his role as a Mentor in the 6th Doctor adventure; Minwarp, which formed part of the Trial of a Time Lord season. It is with deepest regret that DWO announces the passing of Classic Doctor Who Actor, Philip Madoc. Madoc also appeared in the 1966 Doctor Who Movie; Dalek's Invasion Earth: 2150 A.D., as Brockley. DWO would like to extend our sympathies to Philip's family and friends. Two Lost Doctor Who Episodes Found! DWO have received reports that missing Doctor Who material from the 1960's is being aired at todays 'Missing Believed Wiped' event at the BFI in London. Christmas has come early for Doctor Who fans as two previously missing episodes of the show have been found, as announced at todays 'Missing Believed Wiped' event at the BFI in London. Episode Three of Galaxy 4 (1965) which was previously missing all 4 episodes, has been confirmed as found. Episode Two of The Underwater Menace (1967) which was previously missing episodes 1, 2 & 4 has also been confirmed as found. It's been 7 years since the last missing episode was found, and fans had started to give up al hope, how did the latest find come about? "This discovery was made by two people, Ralph Montagu and a film collector meeting and realising there was a bit of a connection. Ralph was working on the Dr. Who restorations in the past and Terry Burnett had some film, but didn't know what." What kind of condition were the stories in when they were returned to you and how much work will there need to be applied to their full restoration? "There's a lot of work to be done on both episodes. Air Lock is missing the last 27 seconds of action and the closing credits. There are many scratches and scuffs plus the usual issues we have with black and white film recordings such as off-locks, videotape dropout etc... Some of the damage will take a lot longer to repair than usual. Underwater Menace poses a different set of problems as well as the more usual. Firstly, it's the ABC's censored print, so the censor clips need to be re-instated. We've already had the clips re-scanned by the National Archives of Australia who have been very helpful. There are numerous film breaks, missing frames, deep scratches etc... and a two second section missing in the middle. That will be the most challenging repair." Is there anything you feel the public can do to help in the search for missing serials, what are your hopes for future missing material, and do you believe there is a chance more may be found? "There are 106 episodes missing from the BBC, but I don't think there are 106 episodes missing in the world. Now, I don't want to get peoples hopes up. I've been mis-quoted before, but I am certain there are episodes out there with private collectors. I know fans are excited by these finds and rightly so, but we're also looking for other lost programmes as well. Yesterday, the BFI screened the Dennis Potter 'Emergency Ward 9', found by a friend of mine Ian Beard. That is an incredible and far more important discovery in my view that the Doctor Whos, yet we're all talking about Hartnell and Troughton eps. I of course understand why, but I think more recoveries like this are more likely if people don't go round asking about lost DW, but black and white TV material in general. So, yes. More material will surface, but I don't know when." + Read DWO's full interview with Paul Vanezis in the Features section. So how did they come to light? “Through me,” says Ralph Montagu, Radio Times’s head of heritage and a lifelong Doctor Who fan. “I occasionally meet up with a group of film collectors and retired TV engineers at a café in Hampshire. + If you have any information regarding any of the lost episodes, E-mail Us! It is with deepest regret that DWO announces the passing of Classic Doctor Who Actor, Derek Crewe. Derek was perhaps best known to Doctor Who fans for his role as Synge in the 4th Doctor adventure; The Sun Makers. DWO would like to extend our sympathies to Derek's family and friends. It is with deepest regret that DWO announces the passing of Classic Doctor Who Actress, Yolande Palfrey. Yolande was perhaps best known to Doctor Who fans for her role as Janet in The Sixth Doctor Trial of A Time Lord adventure; Terror of the Vervoids. DWO would like to extend our sympathies to Yolande's family and friends. BBC4 will be paying tribute to Elisabeth Sladen by airing the Classic Series story; The Hand of Fear. The adventure, which features Sladen's last regular appearance as Sarah Jane Smith in Doctor Who, will air in two parts on Monday 9th May and Tuesday 10th May 2011. + The Hand of Fear was originally broadcast between 2nd-23rd October 1976. It is with deepest regret that DWO announces the passing of much-loved Classic Series Actor, Nicholas Courtney. Nicholas (born in Egypt in 1929), was known to fans for his role as Brigadier Alistair Gordon Lethbridge-Stewart in the Classic Series of Doctor Who. He was the only actor to have worked with all of the first five Doctors, as well as the Seventh Doctor from 1965-1989, and was one the longest-serving co-stars in the show's entire history. Courtney's first appearance in Doctor Who was as Space Security Agent, Bret Vyon, in the First Doctor adventure; The Daleks' Master Plan, but it was for his role as Colonel Lethbridge-Stewart (later Brigadier), who made his first appearance in The Web of Fear in 1968, that fans regard most. The Web of Fear, The Invasion, Spearhead from Space, Doctor Who and the Silurians, The Ambassadors of Death, Inferno, Terror of the Autons, The Mind of Evil, The Claws of Axos, Colony in Space, The Daemons, Day of the Daleks, The Time Monster, The Three Doctors, The Green Death, The Time Warrior, Invasion of the Dinosaurs, Planet of the Spiders, Robot, Terror of the Zygons, Mawdryn Undead, The Five Doctors & Battlefield. In 2008, Courtney returned to the role in the spin-off series, The Sarah Jane Adventures, in an episode titled, Enemy of the Bane. Fans had long been requesting his return to Doctor Who, but, alas, it never came to pass. As well as taking part in several Big Finish audio adventures, Courtney also featured as a regular cast member in Cosmic Hobo's The Scarifyers, as Detective Inspector Lionheart, in which his co-stars alongside Terry Molloy (Davros in the Classic Series). Courtney is survived by his wife, Karen and children, Bella and Philip, whom DWO would like to extend our deepest sympathies to. "Hearing this news is indeed an incredibly sad blow to fans worldwide. On a personal note, I have had the pleasure of meeting, and indeed working with Nicholas over the years. He was always an incredibly warm, generous and wickedly funny man, who always found time for his fans. He will be sorely missed and leaves an irreplaceable void in Doctor Who." "I last met Nick at a fundraiser 18 months ago in a Tottenham restaurant where of course he was on good form; everyone wanted to speak to him and not the guest speaker!! A fond memory I also have is at breakfast at a convention and dear Nick just couldn't work the tea machine and turned to me and "Benton's never around when you need him". He always had time for the fans, thanks Nick and we'll raise a pint for you!!!" "I was fortunate enough to meet Nick on many occasions, and he was always such good value. He was very well respected by both fans and peers alike, always in demand and always a witty, clever and thoroughly professional man. The acting world - and Doctor Who in particular - has lost a shining star, and my heart goes out to the many affected by his passing." "I was not fortunate enough to meet Nic! I have watched so many hrs of Dr. Who that included this fine actor. He has made such an impact on my life, brought me many hrs of enjoyment and I feel as though I have lost an old friend or family member. He will be truly missed and never forgotten!" 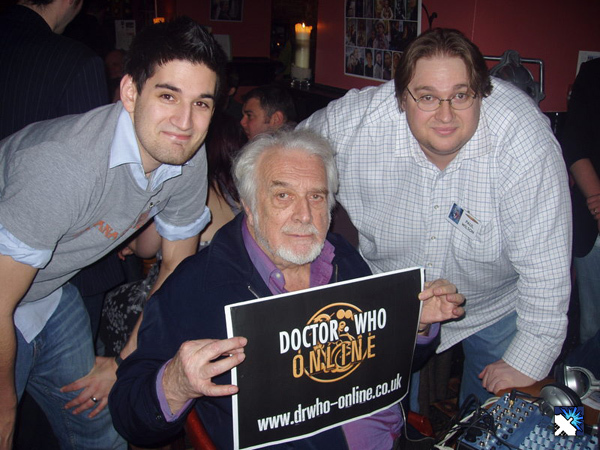 "@drwhoonline RIP Nicholas Courtney 1929-2011. In memory I'll be watching Inferno cos he was just bloody brilliant in it!" "@drwhoonline I don't think I've seen anyone or anything else applauded and welcomed with such passion." "@drwhoonline R.I.P nicolas courtney I may not of watched all your episodes but you were brilliant in SJA and the five doctors." It is with deepest regret that DWO announces the passing of Classic Doctor Who Actor, T.P. McKenna. T.P. was perhaps best known to Doctor Who fans for his role as Captain Cook in The Seventh Doctor adventure; The Greatest Show in the Galaxy. DWO would like to extend our sympathies to T.P. 's family and friends. There’s no doubt that the appearance of Doctor Who on LOVEFiLM’s catalogue has gotten us excited – the chance to enjoy our favourites whenever we like (within reason) seems a good enough reason as any to get in a good mood. And while the presence of Matt Smith’s recent outing is good enough for now, one thing that has caught our eye is the wealth of old episodes that LOVEFiLM has to offer. We all know that the Doctor has been on fire since 2005 and we need little excuse to revisit any one of hundreds of moments from the run. However, it’s reassuring to know that if we need to recap an episode, catch up with one that we’ve missed or simply relive the excitement all over again, LOVEFiLM has it covered. To have classics such as Jon Pertwee’s Inferno, Tom Baker’s City of Death, and Sylvester McCoy’s The Curse of Fenric available as well as other movies online whenever you want them, thanks to the LOVEFiLM Player, is a treat that we’re really looking forward to – even if it doesn’t come to fruition. For now, of course we’re happy with whatever we’re given, and LOVEFiLM are allowing us to get our hands on copies of Doctor Who for a fraction of what it would cost to buy the box set, or even to rent it in the conventional way. So, in truth, there’s no excuse for going without a Doctor Who fix thanks to LOVEFiLM, providing a fantastic TV back catalogue at a great price!